When working in the narrow confines of a submarine’s escape hatch, you must be careful—especially when lifting an expensive and highly sensitive laser scanner through an opening no wider than your shoulders. Thus began what was likely to be our most complex and technically difficult project to date: one largely belied by the enthusiasm of our surveying crew. The task was for us, Portland, Oregon-based i-TEN Associates, to acquire highly detailed 3D imagery of the complete interior and above-water exterior of the USS Blueback, a U.S. Navy fast attack submarine—and an occasional Hollywood prop—currently moored along the east bank of the Willamette River in downtown Portland. The USS Blueback is on loan to the Oregon Museum of Science and Industry (OMSI) as a living maritime exhibit from the U.S. Navy and Department of Defense. Click above for a laser scanned point cloud of the USS Blueback or click here to view it on YouTube. Although this scanning project is unique in scope and unparalleled in level of detail, it’s not the first time a military submarine has been laser scanned. In 2001, one of the first terrestrial 3D lidar units in the United States was used by Pacific Survey Supply (based in Medford, Oregon) to digitally laser scan both the exterior and interior of the first successful combat submarine in history, the Confederate Navy vessel CSS Hunley. What is striking is the advancement that static laser scanning technology has made in just a short time. On the Hunley project, using both the CYRAX 2500 lidar scanning system and a Nikon NPL 820 reflectorless total station, Pacific Survey was able to capture more than 1,000 laser points of measurement per second. From this, they were able to produce a 3D digital model with +/-3mm accuracy of the Hunley for its team of archaeologists. A decade later, the accuracy, efficiency, and affordability of terrestrial laser scanning have remarkably changed for the better. New technology allows us to capture points at more than 950,000 points per second, add colors for photo realism, and provide data accuracy up to +/-2mm. 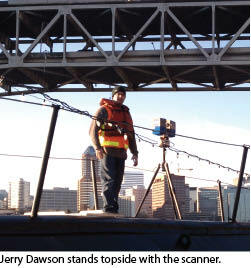 i-Ten’s scanning of the USS Blueback pushed both the limits of this technology and the ingenuity of their scanner technicians. The project’s primary focus was to create a 3D visualization model to be used by OMSI. Because of the submarine’s tight corridors, steep staircases, and small hatches, many patrons with physical limitations are unable to take a tour. The 3D image provides a more interactive media than photos, and a virtual “walk-through” lets visitors feel like they have actually walked the Blueback’s decks. Other objectives included the digital preservation of maritime history and technology and marketing uses for both OMSI and i-Ten Associates. An important aspect to the project was putting the scanning equipment and technicians through their paces in an environment about as complex as any available. Despite her overwhelming exterior size, the USS Blueback’s interior pressure hull is extremely cramped. Designed to dive between the surface and 1,050 feet below sea level, the Blueback is fitted with an astounding amount of technical gear and armament, including 18 torpedoes, three Fairbanks-Morse diesel engines, battery gear, and communication and sonar equipment. Some, if not most, of her interior passageways range in width from 18 inches to a spacious two feet, with an overhead clearance of just over six feet. The passageways of the boat literally intertwine around and throughout the equipment, almost as an afterthought. Scanning and seamlessly meshing more than 80 independent laser scans (both interior and exterior) on a floating submersible warship provided many technical challenges. With scanning the exterior, the issue was the black anti-fouling/sonar absorbing paint and the curvature of the hull. Scanner placement was critical to circumvent large voids in the data. Furthermore, the up-and-down motion of the submarine on the river made it difficult for targeting on the dock next to the sub. Back inside, the concerns continued to stack up. With tight compartments, hard-to-reach rooms, wall-to-wall equipment, and line-of-sight impediments, the scanners’ logistics were as complicated as setting up the control targets. Other problems that had never been addressed prior to the scanning were the lack of magnetic surfaces for our sphere targets (because of the need to lower the magnetic resonance of the vessel, a large majority of the interior metallic equipment is made of non-ferrous alloys) and the constant flow of tourists moving throughout the sub. After studying the blueprints and scouting out the sub, we established a contingency plan that covered most of the scanning impediments. Because we could not plaster the walls with targets that would be readily visible from compartment to compartment, we decided to use a “flight-path” approach to the scanning. This method places the scanner in directions linear to the previous position, with minimal target placement. For each scan we used at least three visible targets, all placed in locations relative to a back sight and a foresight. As we moved the scanner along the flight path, we leap-frogged the targets after a minimum of two scans each. We used the plane of the floor to lock in the vertical alignment. Next was the consideration of speed verses quality. For this to be a precision production, we required a greater resolution than for a normal building-information-modeling-meshed scan. The overwhelming number of knobs, levers, switches, and buttons on a submarine is staggering, and we wanted to capture them all in detail. We were also limited on time because the public tours are quite regular. We therefore decided, after several trials and errors, on a one-half-inch scan resolution/ratio not common on large-scale projects. In the majority of environments we work in, a one-quarter-inch resolution is more than sufficient to collect the necessary point-cloud returns; this also helps to minimize data-file storage size. However, the uniqueness of the project warranted the extra processing time. The scanner, a FARO Photon 120, was set to a noise compression factor of 4X, which compresses the data collection to about 366 thousand points per second. When you include the photos taken by our Nikon DSLR 300s with DX-Fisheye lens for point-cloud colorization, the total time per location was around seven minutes. Planning and setting up both the scanner and targets for each point took considerably more time. The exterior hull was the first to be scanned; we set the scanner on the hull itself, then began at the vessel’s stern and moved towards the bow. Because of the teardrop shape and black color, we spaced the scan locations only 15 feet apart to ensure accurate overlapping data capture. Standing on the back of a 200-foot submarine gives you an amazing perspective you can’t get from the dock. We placed sphere targets in positions along both the boat and dock to allow us to see them from multiple locations. The final exterior scan was taken from the opening of the main entrance hatch located just behind the sail (the USS Blueback was the first U.S. submarine to move the control/conning center to the central hull), so we were able to tie the exterior and interior scans together. The interior “flight-path” began in the upper levels of the officers’ quarters and moved through the officers’ mess and the radio room into the brain of the sub, the control room. This is filled with so much equipment that there is virtually no exposed interior hull. The registration issues we faced here included the thousands of small switches and knobs. The potential was considerable for objects not lining up; therefore, to avoid a disjointed final mesh we took seven scans in only a 25-foot space. This allowed us to collect as much data that was perpendicular to the scanner as possible. Another important goal was to thoroughly capture every millimeter of the twin periscopes, the focal point of the control room. With the upper level completed, we moved down to the crews’ quarters, the head, showers, sonar center, and into the torpedo room. The torpedo room is by far the largest single compartment in the submarine. It encompasses the entire bow of the vessel, from port and starboard sides of the hull up to the forward escape trunk. Torpedoes are stacked three high and three deep on both sides of the room, with a narrow catwalk running down the middle. The Blueback currently has a variety of vintage and modern torpedoes racked, including the venerable Mark 14 and the more modern Mark 48. Across the nose are six torpedo tubes on two levels, with catwalks and control panels between them. To capture as much detail as possible we had to get creative. For the tops of the torpedoes and upper tubes, we assembled the scanner with the tripod legs straddling the gap of the catwalk and set into the cradle of the upper torpedoes six feet in the air. We ended up with eight scans shot at four elevations, allowing us to capture subtle details, such as the mattresses that lay between the torpedoes for the crew to sleep on and shots down the open torpedo tubes. Once we completed scanning, we began the onerous and less glamorous task of registration and post-processing. The general workflow of processing the scans was to pre-filter, register, colorize, post-filter, and then create the various file formats needed for the deliverables. We processed the first three steps in FARO Scene 4.8. Filtering prior to registration removed any stray points and points beyond a specified distance from the scanner head. The registration of the scans followed the flight-path of data collected. We started with a scan that had the greatest field of view of targets and made it the reference scan for all the scans on that elevation level. The scans were registered together making them a “cluster” of data. Scans from the other levels of the sub were made into clusters according to their locations, and then the registered clusters were placed together to create one seamless and contiguous point cloud. The individual scans were all colorized with their corresponding photos. Unfortunately, at this point the file sizes of the scans are still too large to render smoothly and efficiently into a hands-on product. This is primarily because of the redundancy of points between the overlapping scans. We also need to de-noise the corners and edges of objects for optimal clarity. For these processes, we will employ VRMesh v.5. By removing the redundancy from the scans we can reduce the file sizes by a third, thereby allowing the files to be quickly indexed and with faster refreshing rates in AutoCAD or MicroStation. The final 3D walk-through will be created with MicroStation in Adobe Premier. We are currently working on programming that would permit the viewer of the 3D imagery to control the walk-through, thereby creating a truly interactive experience. Unfortunately, many historical, cultural, and geological public-use sites do not accommodate the needs of people with physical limitations. Like the USS Blueback, most sites can’t receive needed adjustments because of finances or concern over historic preservation. Even for able tourists, some areas of the Blueback are off limits for safety reasons. We see this advanced scanning technology as a phenomenal way to give all who have an interest in these subjects a chance to have a unique interactive experience, even if they can’t physically be there. Laser scanning doesn’t always have to be about engineering, or manufacturing, or even about making money. Sometimes it’s about scanning something because it’s there, and in this case in particular, that was good enough for us. Eric Stone III is vice president of remote sensing and photogrammetry operations at i-TEN Associates in Portland, Oregon. He has spent nearly 20 years in the cartographic and remote sensing industry. operates N2Deep, his own geospatial and underwater services company.